Case Studies in Sport Law, Second Edition, provides students with specific examples and perspectives of some of the most significant cases in sport law in an accessible tone that is free of legal jargon. The text is an ideal companion for non-law students who are seeking clarity and context for legal issues commonly encountered in sport management and sport law settings. The 87 cases provide real-life applications for students and scholars of sport management. This updated second edition of Case Studies in Sport Law contains one new case study to provide a more contemporary example while maintaining the most significant precedent cases. The text is easily incorporated as a supplement to course studies, especially for its recommended companion text, Introduction to Sport Law, Second Edition. These two texts were designed with the other in mind, and the structures match each other in order of topics presented so that students can easily cross-reference the two to obtain the best understanding of sport law. ... Litigation and lawsuits in sport are increasing; therefore, managers and operators must maintain a thorough understanding of legal practices. 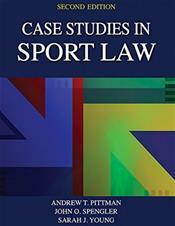 Case Studies in Sport Law is the ideal text to supplement a sport management or sport law class and bolster student comprehension of sport law issues, and it is a supreme reference in the professional library of all practitioners in college, high school, professional, and recreational sport settings.